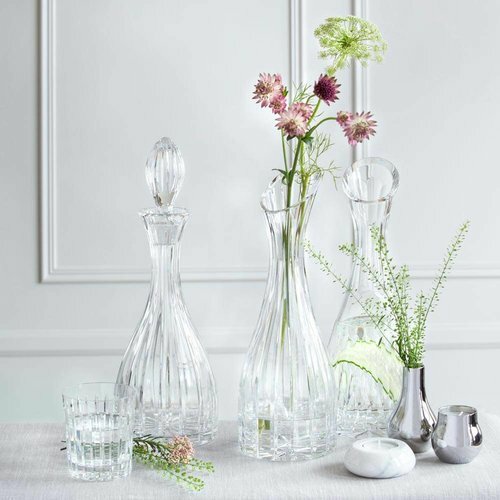 Over my career as a designer and owner of crystal a glassware company, I came across a number of myths about crystal glassware. It seems that every brand uses different marketing messages to show their product in the best light. Of course, it is not a surprise that everyone creates a beautiful story behind the product, however, some explanations or rather justifications for something are simply marketing messages. I’ve worked with a number of crystal glass factories, those who create lead crystal, non-lead crystal glass as well as plain, soda glass. I have participated in various productions of samples in different factories and learned about the crystal glass. 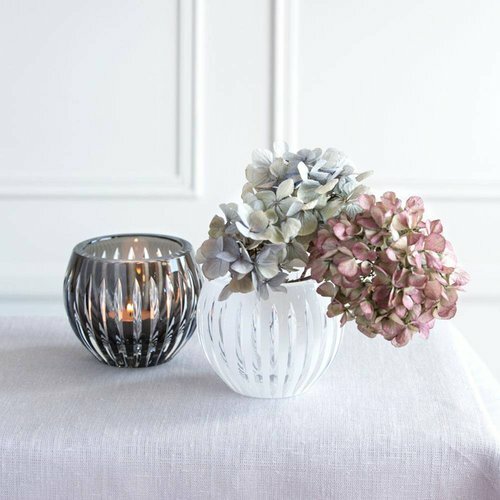 I would now like to challenge some of these myths, which I came across in various posts and articles about crystalware online. And here are some of the myths around the question of how to distinguish classic crystal from plain glass? The term Lead- free crystal does not exist. In the European Union, labeling of crystal products is regulated by Council Directive 69/493/EEC, which defines four categories, depending on the chemical composition and properties of the material. Only glass products containing at least 24% of lead oxide may be referred to as "lead crystal". Products with less lead oxide, or glass products with other metal oxides used in place of lead oxide, must be labeled "crystalline" or "crystal glass"
Hold up a glass to the light. If the glass acts as a prism and you see a rainbow you are holding the crystal. If not, it is just plain glass. A commonly called "crystal", is a variety of glass in which lead replaces the calcium content of a typical potash glass. The technique of adding lead oxide (in quantities of between 10 and 30%) improves the appearance of the glass. The brilliance of lead crystal relies on the high refractive index caused by the lead content. One alternative material is crystal glass, in which barium oxide, zinc oxide, or potassium oxide are employed instead of lead oxide. Lead-free crystal has a similar refractive index to lead crystal. However, if it does not create a prism it will be an ordinary plain glass. Crystal can be worked thinner than glass, so if the rim of a piece is exceptionally thin it's probably crystal. Crystal cutting techniques exploit crystal properties to create a brilliant, sparkling effect as each cut facet reflects and transmits light through the object. However, in order to be able to cut in crystal, the glass bowl needs to have some thickness. Both lead crystal and lead-free crystal glass can be cut however, the rim might be slightly thicker. If the designer decided not to have any cut and the aim of the design is to make light, thin and as light as a possible design then it is possible to create such a glass. However, nowadays, a number of ordinary soda glass manufacturers produce very thin plain glasses which are not crystal. If you compare two glasses of the same size, the crystal glass will be heavier. With modern technologies, the finest crystal craftsmen can hand blow very thin, fine crystal glasses. Usually, lead/barium content will make the glass slightly heavier, however, if they are blown according to the intended design, which is for the thin, plain crystal bowl than, the glass will be thin. 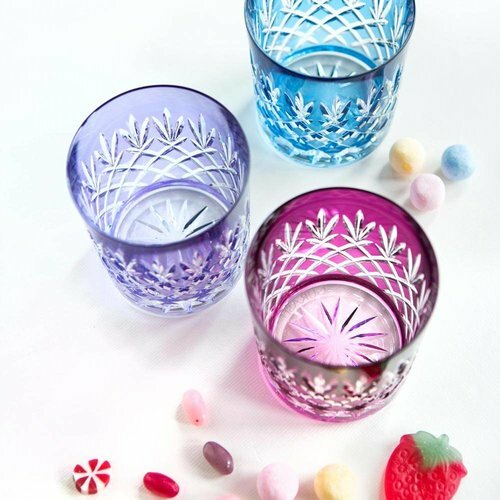 Examples of it are Bomma crystal glasses including collections such as Kasik. Although Lead-free crystal glass has a similar refractive index to lead crystal, it is lighter and it has less dispersive power. Glass typically has sharp cuts, while crystal will have clean, rounded cuts. This statement is quite superficial. There is some truth in it, only if the designer wishes to have soft cuts on the glass. Personally, I prefer sharp edges or frosted effects on the crystal. 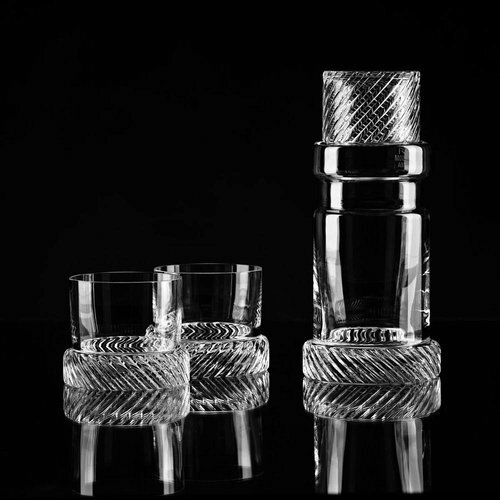 Thus, there are production modes the glass cutters apply to achieve sharp edges on our coloured crystal glassware. Traditional cut crystal is cut by hand on diamond or stone wheels on a lathe to create the desired pattern. The wheels abrade the glass leaving a white 'ground' finish to the glass. This needs to be polished to a high sheen to finish the piece. This is achieved by immersing the lead crystal in a mixture of undiluted Hydrofluoric and Sulphuric acid. 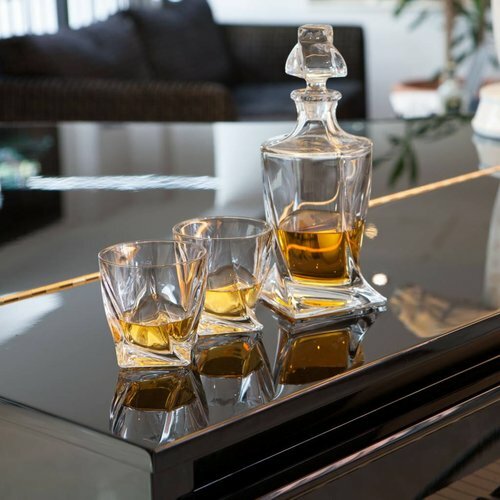 The consequent exothermic reaction can achieve temperatures in excess of 80 degrees Celsius, which are required for the polishing process, which is essentially a dissolving of the glass. This results in soft edges in the clear crystal glass. However, in our productions technique of coloured crystal, the cut is applied at the final stage. After the blank glass is made, the colour is applied to the outside. At this stage the coloured glass goes back to the furnace to burn, the glass is then cut by hand. This means that he cut glass does not go back to acid polish because this would take away the previously applied colour. The final design has sharp edges. I hope this article made it easier for you to understand different techniques and terminology in crystal glassware. I know that I might make it more complicated for you to distinguish crystal/ crystal glass from soda glass. 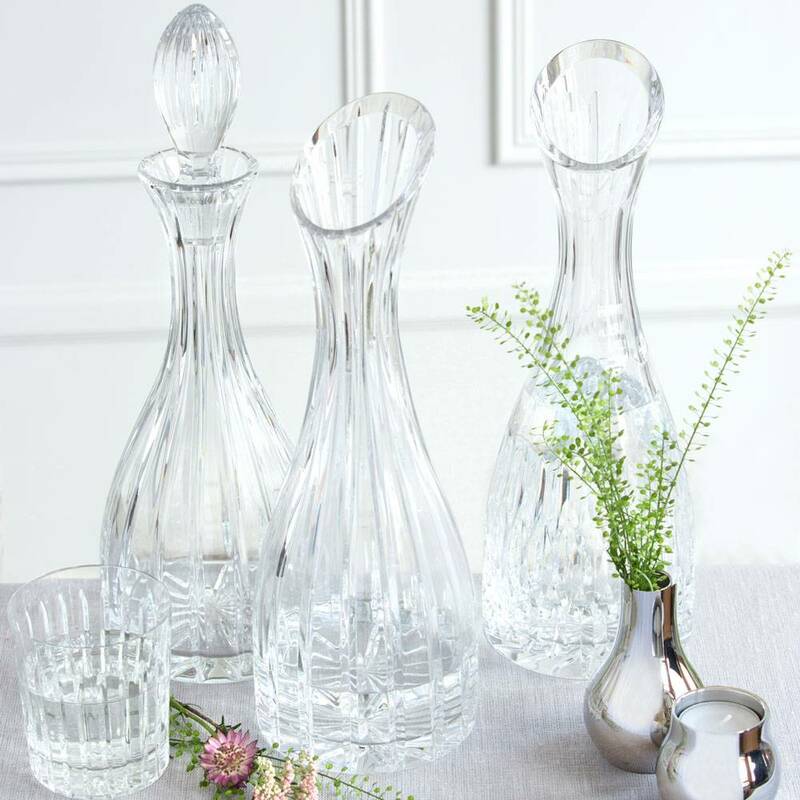 The best advice would be to buy your crystal glasses from reputable crystal brands.